NEW YORK, New York — The Hayastan All-Armenian Fund is pleased to announce that it successfully concluded its 13th International Telethon by raising yet another record-breaking $20.8 million in pledges. The live 12-hour show aired from KCET Hollywood Studios and reached millions of households globally on satellite and cable networks, in addition to being broadcast online. The live program featured a rich presentation of Armenian music and entertainment, as well as celebrities, political, and community leaders, and long-time Armenia Fund supporters and donors. Several prominent celebrities endorsed the Telethon and its efforts, including California governor Arnold Schwarzeneger, Los Angeles mayor Antonio Villaraigosa, French actor Gerard Depardieu, reality TV star Kim Kardashian and others. The Telethon culminates Armenia Fund's global fundraising campaigns that included phone-a-thons, gala dinners, charity concerts, radiothons, as well as the annual benefit gala held in Moscow and the 11th Pan-European Phone-a-thon held in Paris. Russian-Armenian businessmen Levon Hayrapetyan and Samvel Karapetian donated $2 million each, constituting this year’s single-largest donors. The funds collected through the 2010 fundraising drive will help extend clean drinking and irrigation water throughout Artsakh. We will also continue our ambitious rural development program in the border villages of Armenia and Artsakh through a comprehensive development strategy, bringing visible, feasible, and profound change where it is needed most. 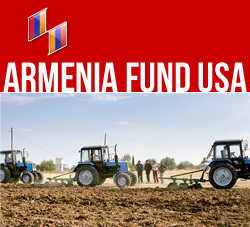 If you missed the Telethon or would like to continue to contribute towards this vital undertaking of improving water infrastructure in Karabakh, donations are still being received via Armenia Fund USA’s website: Donate Now Online. By December 15, a press conference will be held by Hayastan All-Armenian Fund Executive Director Ara Vardanyan to give detailed information regarding total number of donors and pledges from the 13th International Thanksgiving Telethon. The Hayastan All-Armenian Fund expresses its sincere gratitude to Armenian communities around the world for the continued and growing support of the Fund's nation-building mission.